Simply put, gas nitriding is the process of infusing nitrogen atoms into the surface of items made of steel, aluminum and other metals. This is accomplished by heating the metal to 520°C/970°F and introducing nitrogen-rich ammonia. The exterior of the item is hardened, leaving the metallic properties of the interior unchanged. It is heavily utilized on automotive components like crankshafts and gears. It is also used to harden dies and machine tools. Liquid nitriding is one of the many hardening services offered by Specialty Heat Treating, Inc. In this process, the item is heated to the desired temperature (550°C/1,020°F to 570°C/1,060°F) and then immersed in liquid cyanide salt. The process infuses nitrogen more deeply into the item; however, it also infuses additional carbon. As with all hardening processes, the metallic properties of the interior are unchanged. It’s time for the main event – liquid nitriding vs gas nitriding. Both processes case-harden items but consider the following differences before choosing a method. The gas nitriding temperature is 520°C, lower than the 550°C to 570°C temperature required for liquid nitriding. The material that contributes nitrogen to the gas method is the toxic chemical ammonia. However, it is not nearly as dangerous as the highly toxic cyanide salts used in the liquid method. The nitrogen infuses to a deeper level with liquid nitriding than it does with gas nitriding. Potentially, this could be undesirable if the item being hardened has some areas where the metal is very thin. 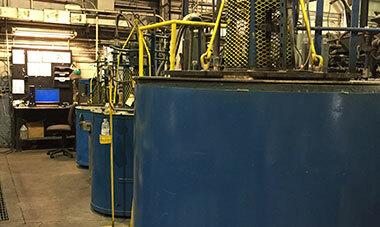 Liquid nitriding infuses additional carbon in the item being processed. Whether this is good, bad or irrelevant depends on the circumstances. Despite the differences, the results are virtually identical for most applications. When it comes to nitriding, you can depend on the experts at Specialty Heat Treating, Inc. to do it right. Contact us at (248) 478-5900 to discuss your requirements.